I thought I was going to have to pass this cake by this week. For the past 2 weeks, Tom and I have been hosting family that has been running away from the freezing weather up north and I been cooking up a storm – frankly I needed a break from my kitchen. So I have no explanation as to why during my shopping trip for tomatoes and basil, I took a package of dry apricots and put it in my basket. I’m thinking that it was my subconscious that had the shopping list on my head for this cake since I read about it once it was posted in the list (Can you tell I’m a planner?). So on Thursday, while making the fresh pasta for the lasagna, the eggplant dip and the Bolognese sauce I came across the apricots and said, why the hell not. And soaking they went. My reasoning was that even if I did not make it this weekend, I could start with the Lekvar (Apricot jam), save it and double up next weekend and put forth two cakes! By Saturday, it was definite that I was NOT going to do this. On Sunday, after a huge amount of bad TV, I had a light bulb moment and talked my way into the kitchen, where before I knew it, I had pulled the book out and started to set the ingredients that I would need to complete the roll. You would think that a roll will not be complicated, but with 5 pages long of instructions and basically 4 different steps to have the necessary components it was an undertaking. But, after making it I realized that it was just lots of steps, but not difficult ones. And after 2 weeks of "easy" cakes, I welcome the challenge. I started with reading the recipe all over again. Because, you know, sometimes “we miss” things. (Keep that statement in mind). I padded myself on the back for having completed the Lekvar ahead of time on Thursday night, and while I could have gone with buying an apricot preserve, Tom convince me that the whole point of joining the club was to expand my baking horizon right? Well, I’m so glad that I made this because the Lekvar was yummy-luscious. I followed the instructions to the letter and the only variation that I did here was that I also include a bit of lime zest (yes, we eat a lot of limes in my house) and that addition gave it a tart flavor profile that I totally loved. I have a feeling we are going to be eating this as much as we did the Orange curd. The actual roll, or let’s just be fancy and call it by the “posh” name: “biscuit roulade”, was pretty straight forward. Eggs, beaten with the sugar, in goes the vanilla extract, folding of flour and then whisk the eggs white to luscious peaks and fold that in as well. Spread it on a baking sheet. The only oh-oh moment was when I was pouring the batter unto the baking sheet and thought I was not going to have enough to cover the whole sheet, but as always, Rose’s measurements were accurate and sure enough the whole pan got covered as it should. Note to self: NEVER QUESTION THE MEASUREMENTS! The bis-KWEE was ready in 8 minutes, and out it came, where I flipped it on a kitchen towel, removed the parchment paper and dusted the top with powdered sugar and rolled it snug as a bug in a rug. Next up the apricot ganache and that was made pretty fast. I used 60% chocolate, I raided my liquor cabinet and found that I had peach brandy in there (who knew!) so in it went and then I put it aside to cool off, after I took a couple of spoonful for a “taste test” of course. While waiting for the ganache to “cool”, I went to the computer and sure enough, Raymond had his post up. And when I saw how pretty the lacquer finish looked, I got in my car and headed to the supermarket to get the gelatin. By the time I came back, it was time to work on the biscuit. 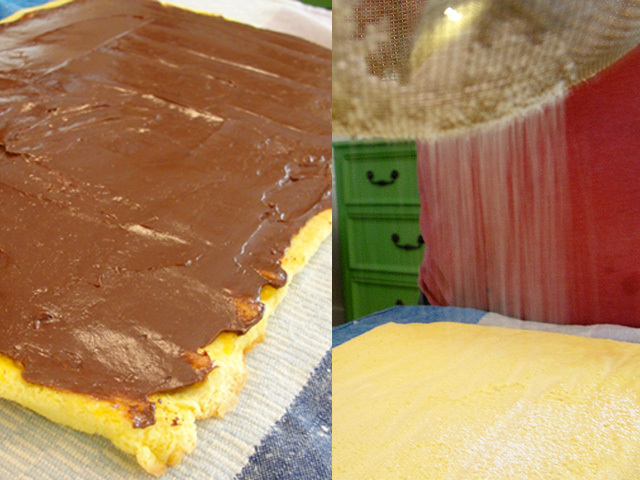 I’m unrolled it, spread the Lekvar, which had a great consistency, then the apricot ganache. Since we were going to eat this that night, I skipped the syrup. Once done, I rolled up back up all snug and put it aside. I went to town with the amazing lacquer glaze. This is one of those things that look really super complicated to make and it’s so outrageously easy, you wonder how in the hell you never tried it before. 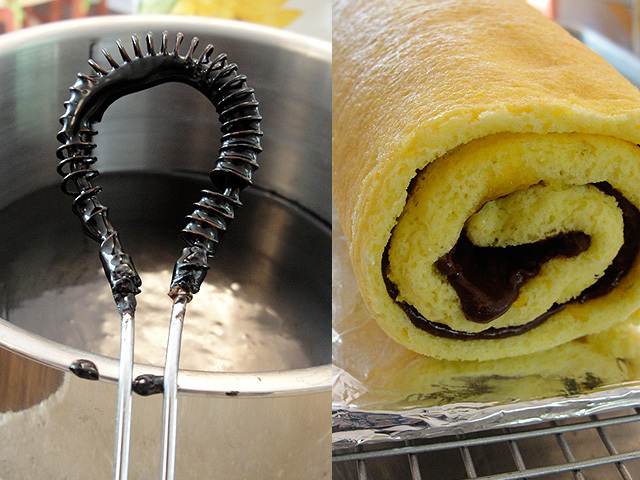 You cook the sugar and water together until the sugar is dissolved, then you add the cocoa powder, the corn syrup and vanilla and whisk away, even at this point it starts to shine. There was a point where I questioned the reason behind the need to pour it through a sieve, not once but twice. But, since this was the first time trying this I was not going to leave any wiggled room for errors. I started to pour it over my now roulade and I realized that I had missed a step. Yep, in all my excitement with the lacquer glaze, I realized that I had not crumb coated it with some of the apricot ganache. I resume and figure it would be ok.
And it was. The end product looked glorious! I wanted to own a bakery right there and there just so I can showcase for all to see and admired and oh and ahh over it. I settled with the praises from Tom and the little man. Me: Once more Rose made a believer in me. Mixing fruit, in this case jam, with chocolate it’s not the end of the world at all. But, a whole other dimension on flavor, one, that I obviously have to try more often. Plus, how can you not be “wow-ed” by that finish?